If you have read my introduction to macvlans and tried the basic macvlan bridge mode network configuration you are aware that a single Docker host network interface can serve as a parent interface to one macvlan or ipvlan network only. One macvlan, one Layer 2 domain and one subnet per physical interface, however, is a rather serious limitation in a modern virtualization solution. 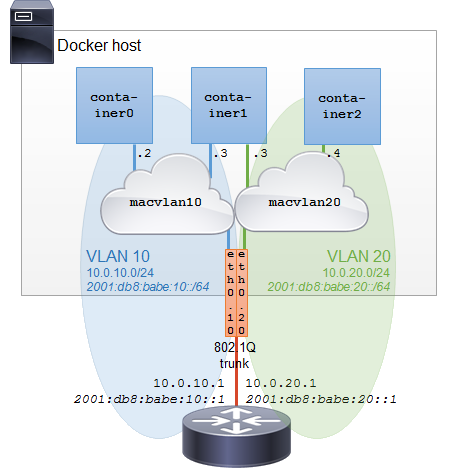 Fortunately, a Docker host sub-interface can serve as a parent interface for the macvlan network. This aligns perfectly with the Linux implementation of VLANs, where each VLAN on a 802.1Q trunk connection is terminated on a sub-interface of the physical interface. You can map each Docker host interface to a macvlan network, thus extending the Layer 2 domain from the VLAN into the macvlan network. You have a Docker host with a single eth0 interface connected to a router. Connection between the router and the Docker host is configured as 802.1Q trunk on the router with VLAN 10 and VLAN 20. Configure VLAN 10 and VLAN 20 on your router. Add the following IP addresses to the Layer 3 interface: 10.0.10.1/24 and 2001:db8:babe:10::1/64 for VLAN 10, 10.0.20.1/24 and 2001:db8:babe:20::1/64 for VLAN 20. … else I’m sure you know how to configure it on your router. You will spin up three containers. You need to connect container0 to VLAN 10 and container2 to VLAN 20. container1 will have two interfaces, one in each VLAN. All containers are dual-stack, running both IPv4 and IPv6. You might have .1Q sub interfaces already configured on your Docker host. That is OK. Docker will use your existent VLAN configuration, just make sure your sub interface numbers match the VLAN tags. If you are not familiar with Linux .1Q configuration, there is no need to learn about it now – it will be taken care of by Docker’s macvlan driver. macvlan10 network uses sub interface eth0.10 as a parent. macvlan20 network uses sub interface eth0.20. You don’t need to configure the IPv4 and IPv6 address – Docker’s IPAM driver can assign an IP address from the network’s subnet automatically. In this case you should configure the IP address only so your containers get the same IP addresses as described here. Remember: Docker controls the IP address assignment for network and endpoint interfaces via the IPAM driver(s). Libnetwork has a default, built-in IPAM driver and allows third party IPAM drivers to be dynamically plugged. On network creation, the user can specify which IPAM driver libnetwork needs to use for the network’s IP address management. For the time being, there is no IPAM driver that would communicate with external DHCP server, so you need to rely on Docker’s default IPAM driver for container IP address and settings configuration. PING 10.0.10.2 (10.0.10.2) 56(84) bytes of data. PING 10.0.20.4 (10.0.20.4) 56(84) bytes of data. PING 10.0.10.1 (10.0.10.1) 56(84) bytes of data. PING 10.0.20.1 (10.0.20.1) 56(84) bytes of data. As expected, there is direct, one hop connectivity between container0 and container1‘s macvlan10 interface. Packets towards the other two interfaces in macvlan20 need to leave the docker host through the trunk link to the router and are routed back through the trunk into macvlan20, hence router’s 10.0.10.1 IP address in the traceroute. If the last two traceroutes fail, verify your router’s configuration. Congratulations! You have just connected your 3 containers to two separate VLAN networks using the macvlan network mapping to a 802.1Q trunk sub interface.